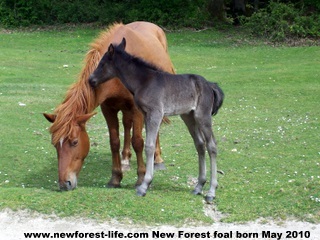 My New Forest foal 2010 photos are here at last! 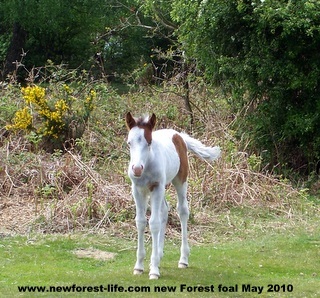 New Forest foal 2010 pics - they are as beautiful as ever! My pictures this year are quite late in coming onto my website. The stallions were put out later and for a shorter time last year. This was so that fewer foals were conceived and also so they would be born later in the season. Here are my 2010 pictures and stories so far. 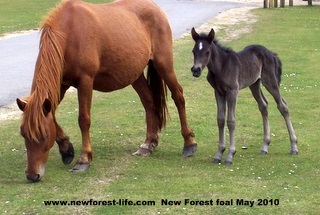 I first saw this little foal in the late evening, probably on the day it was born. I was a bit concerned as although it was feeding it seemed a bit lethargic. They are very strange (and often quite worrying) on their first few days after birth. As you can see it was quite alert, at times but then went into a state of quietness. New foals, when they are older than this one tend to run round feeling their feet, eat and then lie down and have a good deep sleep for at least 15 minutes! Just like children. Then they are up and ready to go again. This photo shows a beautiful sight I came across on my walk. I wanted to get this little chap in, but also capture the bluebells too. Who said you had to go to Ikea for a comfy bed???? I crept up on this little sound asleep chap - it is the same foal from the picture above but this is a couple of weeks later and he has grown a lot. The foals do go into a deep (and enviable!) 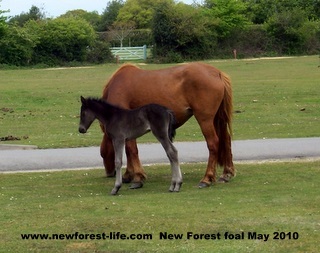 sleep when they are young - most New Forest ponies are good mums and keep a very vigilant eye on them. This mare knows me but was aware the whole time I was taking this photo. 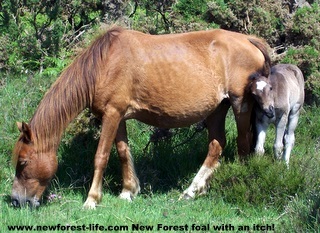 New Forest foal with an itch! 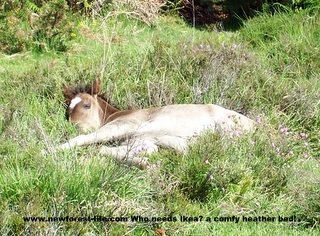 This is the same foal who was sleeping in the heather - he got up and thought it would be safer to be closer to mum - she had given a little warning "snicker" sound to him to say get in line. 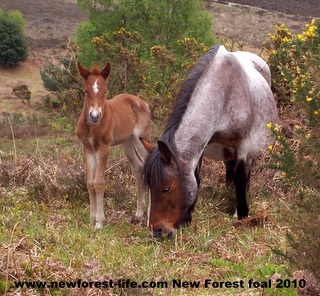 When you see the New Forest ponies with their young foals they are usually really tolerant. This little chap kept shoving his head between his mums back legs to avoid the flies and she just allowed it! When I was out walking looking to see how this new born foal was coming along I was surprised to see her very close to this mire or bog. Foals legs are very vulnerable for quite a long time, but this is a good and sensible Mum and had not taken the foal through the mire - thank heavens! 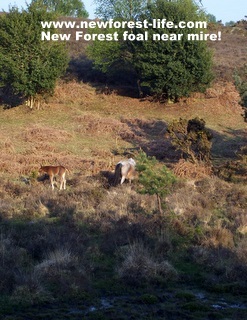 The New Forest ponies have really varying skills - just like human mothers. Some seem to be sensible, caring parents and others are lax! This Mum loves food and spends every waking hour eating, but she is also always aware of danger. 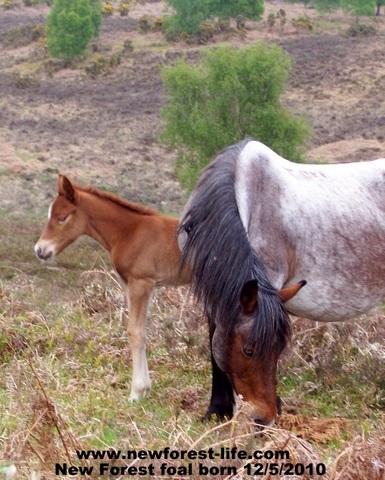 This New Forest pony is not such a good mother as the one at the top of the page. Although she is eating ravenously to keep her milk supply good, we have just come back from a walk and seen her on the edge of the road with her foal on the dangerous road edge whilst she eats in a safe gulley. A foal this young would be very jumpy at the sound and sensation of cars passing and may jump out in fear! 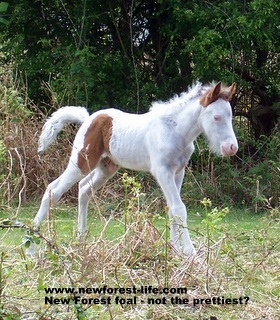 This little foal was only max 24hrs old here. Notice how close together the little front shoulders are. They always take a few days to totally unfold and get their bodies just right! 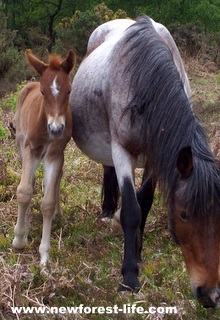 It will be getting messages from the New Forest pony mum to keep close and be aware of the strange human taking photos. I was very careful at all times to keep a good distance, although the mother knows me I wouldn't want to upset her. 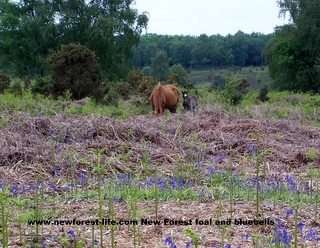 This little foal will turn out to be quite a large New Forest pony. If you look at the leg joints you can see they are bigger than the dark foal above. They are all different, depending on their parents size and strengths. In this picture the crumpled look is still seen as it was only born within the last 24hrs. We have been out and about today and saw this little chap. he will have to be very careful if we have a hot summer (as if!) as he will burn easily on his pale, white skin.He was just finishing off a call of nature and you can see he is very pale around his eyes and nose. These are vulnerable areas for all animals if they get too much sun. Here is the same little lad looking much more handsome! His mother is a bay new Forest pony so I can't imagine what his Dad looked like!As we drove across the New Forest today we saw that the stallions were out herding up the mares and causing panic and confusion to clusters of ponies. The saddest sight is seeing the frightened little foals trying to get out of the way of a marauding stallions trying to make babies with their mums.